From a very young age, I always liked to travel and see new places, which made certain parts of my career choice to become a chef a very good idea. More than forty years later, after stops in England, Western Canada and the West Indies, I put down roots and made London, and more importantly Western, my home and place of employment. 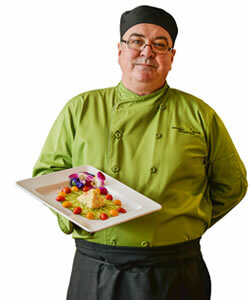 Now as Head Chef of Great Hall Catering, it's time to bring all the skill and knowledge gleaned from my travels around the world and implement them into our community's catering needs, while passing my experience onto the next generation of Western chefs. I'm a happily married father of two with strong family values. Running a kitchen can be a lot like a household, everyone has to work together and try their best to achieve happiness and success. I have been a member of the Great Hall Catering team for the past six years. In that time, I have enjoyed the fact that one day I'm feeding 2,000 people hotdogs and hamburgers, and the next, I'm catering an elegant dinner for 10 at the President's home at Gibbons Lodge. We have a very diverse mandate, but everything we do is done with precision and attention to detail. 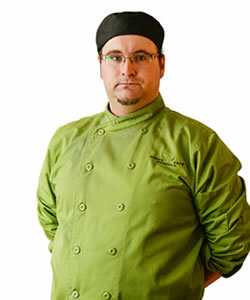 I am originally from St. Catharines, where I studied Geography at Brock University - before I read "Kitchen Confidential" and decided to become a chef. 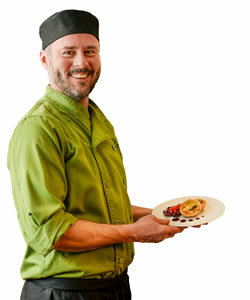 I received my diploma in "Culinary Management" from Fanshawe College and proceeded to start my career here at Western. This year, at the Green Leaf Café @ Somerville, I hope to create a cuisine, both in flavour and presentation, which is somewhere between the avant garde chefs like Ferran Adria of Spain and Rene Redzepi of Denmark, and the nostalgic Canadian cooking of the Joe Beef guys and Martin Picard of Au Pied de Couchon, while working with small producers and fresh local produce of the London area. I have always loved food and feel lucky to have been able to turn this love into a career in cooking. I spent more than 15 years sharing my passion with friends, co-workers, and guests. After graduating from culinary college and with formal training from the French and Asian cuisines, I began working in 5-star hotel kitchens. I jumped right into the deep end and started my kitchen experience working at the Ritz Carlton, in South Korea. 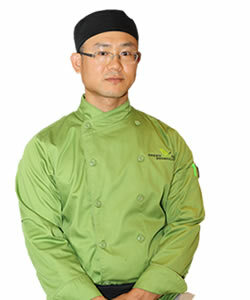 I worked in the fine dining restaurant, Italian restaurant and the banquet kitchen, at the hotel. Having worked in various positions, I quickly learned the importance of customer service. After Korea, I continued to gain more restaurant experience in Miami at the Ritz Carlton, Key Biscayne and in an Italian restaurant. My past experience has helped me gain fresh insight and a thorough understanding of the crucial elements required for successful food preparation and service. Now, I am a proud member of the Great Hall Catering team. My moto is, "Do my best and then be the best." I always do my best, rather than trying to be the best.